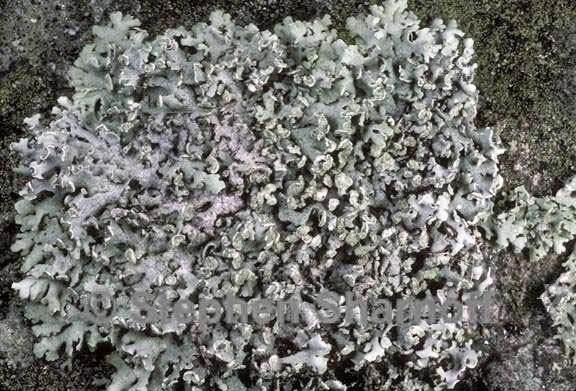 Thallus: foliose, up to 3 (rarely 4) cm in diam., irregular to orbicular lobes: short and rounded to somewhat elongate, discrete to somewhat imbricate, (0.2-)0.5-1.5 mm broad, flat, sometimes ascending at the end upper surface: almost white to gray-brown, epruinose, sorediate soredia: powdery to granular, rarely coarsely granular, in primarily marginal and terminal, labriform soralia, some irregular laminal soralia sometimes also developing upper cortex: paraplectenchymatous medulla: white lower cortex: prosoplectenchymatous lower surface: white to pale tan, dull or weakly shiny; rhizines: simple, concolorous with the lower surface Apothecia: rather rare (not seen in Sonoran material), up to 1 mm in diam., sessile to very short stipitate, the margin entire or becoming irregularly crenate ascospores: brown, 1-septate, ellipsoid, 17-22.5 x 8-11 µm, Physcia-type, the lumina sometimes rounding with age Spot tests: cortex and medulla all spot tests negative Secondary products: none detected. Substrate and ecology: bark or wood, occasional on rock World distribution: North America, Europe, Asia, east Africa Sonoran distribution: Arizona, southern California, and Sonora. Notes: Physciella chloantha is highly variable in the southwest. Typical specimens with broader lobes and strongly labriform soralia might be confused with those sorediate species of Phaeophyscia which have a pale lower surface. However, those species, Phaeophyscia culbersonii and P. nashii, typically have mostly marginal rather than terminal soralia (and not or weakly labriform), and both have a patchy epinecral layer on the upper cortex. Much more difficult to determine are the very narrow lobed, sparsely sorediate specimens of Physciella chloantha, which almost exactly mimic Phaeophyscia nigricans, and can be distinguished from that species with certainty only by examining a section of the prosoplectenchymatous lower cortex.